Are you getting your beauty sleep? A good night's kip is worth a whole shelf full of the latest beauty lotions and potions. 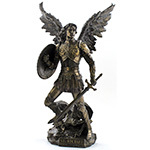 If you're having trouble getting enough shut-eye, ask Archangel Michael to assist you. Place an angel figurine by the side of your bed so that your unconscious mind will remember that he's watching over you keeping you safe and secure and aiding pleasant dreams. Sweet dreams.